The CurrentCost meter has been ignored of late as I’ve been a bit busy with other things. Tonight, I started playing with it again. The more geeky amongst us have connected the CurrentCost to a server of some sort. By connecting it to something that’s always on, we can collect a history one reading at a time. But what about people without a server? How can they collect history? As Rich highlighted in his post on the CurrentCost XML output, the CurrentCost meter maintains some running totals in flash memory, and these are included with updates for every reading from the device. This means that if you store and aggregate these history totals, you can connect the meter to a computer periodically and still get reasonable CurrentCost readings history. Okay, so the two-hourly history might be a bit much, but the others all seem reasonable, even for non-geeks! Like my Slug home server, my ThinkPad doesn’t have a COM port, so I’m using a USB to Serial adaptor cable. When I got it, it came with a CD with Windows drivers. Unfortunately, knowing that I’d be connecting it to a Linux server, I binned this. Whoops. Unlike the Linux app I’ve been running so far, this app wont be a long-running background task – all I need is to get a single update from the CurrentCost meter, because that will have the history data that we need. As Rich outlined, the data from the CurrentCost meter comes down the serial port in XML form. So I read a single line from the serial port and try and parse the XML. If I fail (if the update is incomplete, the XML cannot be recognised, or if there are any other problems), I discard it and read another line. Nothing too elegant here – for a first quick hack, I use an XmlReader to read through the line and get the values from it. If anyone wants a copy, the class that does this is here. The only slight tweak over just trying to turn XML into a series of text and number fields, is that I’ve added the ability to discard the timestamp in the XML and replace it with time taken from the computer where the code is running. As I said at the start, the CurrentCost data is relative – it gives the total readings for “three days ago” or “two months ago”. To store this as a historical reading, I then needed to translate this into an absolute timestamp. For years, months, and days, this is easy. For example, a reading for four days ago (“d5”), is going to the total reading for 11th June. The history for hours was a bit more confusing. You get thirteen (why thirteen?) readings for two hour blocks: h2, h4, h6, h8, h10, h12, h14, h16, h18, h20, h22, h24, h26. I’m not sure what this means – what does “h2” mean? A total for midnight – 2am? A total for the last two hours (e.g. 7.40pm-9.40pm)? A total for the last two complete hours (e.g. 7pm-9pm)? A total since the last ‘even’ hour (e.g. 8pm – 9.40pm)? Dunno… I’ve written a script to capture the hours data for a day – I’ll take a look at what it collects by tomorrow and try and reverse-engineer it! For now, my code doesn’t try to calculate hourly totals. Update: I’ve since worked out the hourly totals, see comments below. I’m storing the readings in a collection by date. If there is already a reading for a particular timespan, it is overwritten with the new history reading. And I’m serializing the collection to XML files of my own. I’m separating it out into separate files – one for yearly totals, one for monthly totals, etc. I mainly did this so that the serialization code doesn’t break when I finally figure out the two-hour blocks and change the collection. I’ve never used Windows Presentation Foundation (WPF) before, but I’ve read about how it offers developers the chance to create more advanced interfaces than the Windows Forms libraries that I’m used to. It has better support for binding interface elements to data objects, richer support for pretty text, easier support for graphics… this seemed like a perfect opportunity to write my first WPF app. As I twittered a little while ago, my first impressions on WPF is that it’s pretty cool, but I’ve still got a lot to learn – it’s quite different from Windows Forms. Annoyingly, there don’t appear to be any graph controls already. I’ve made a stab at writing my own bar graph control – I basically draw a series of rectangles, and adjust the height based on the CurrentCost reading I’m representing. I’ve not worked out a nice way of adding labels to the graph axes, which is a pain. For the moment, I’ve reused the event colour-changing code – when you hover over a bar in the graph, I display the height of the bar in a text box, to give the CurrentCost reading for that bar. The problem is, as that event only knows of the bar as a graphical Rectangle object, I’ve only got the height from it. I can’t say what timespan the reading was from. Hmmm… annoying. Bit more practice with WPF needed, methinks! Still, for my ‘Hello World’ app and the result of an evening’s work, I’m pretty happy with it so far. It’s not finished, but it’s a start… once I figure out the daily history data (Update: done! 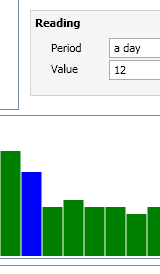 ), and learn how to draw graphs in WPF properly, it should start getting more useful. But if anyone wants to play with what I’ve got working so far, please feel free! This entry was posted on Sunday, June 15th, 2008 at 9:33 pm and is filed under code. You can follow any responses to this entry through the RSS 2.0 feed. Both comments and pings are currently closed. Nice work Dale. I’m yet to have a play with my current cost like this. I’m still playing catch up and should have my slug online this week hopefully. Loving playing with this type of gear. I’ve worked out how the hourly history data works – seems pretty straightforward. They are two-hour buckets giving the total since the last “even” hour? Looking at it like that, it makes sense to me now why there are 13 updates – it means you can get twenty-four hours worth of updates. I have run your windows software but can not get it to work. On one PC it says I need a newer .net framework as I only have version 1. On another I have version 2 and when I run your program nothing happens. Do I need version 3? @Dave – yes – I wrote it with .NET 3.5. Although I think .NET 3 would probably be enough. FYI – As I’ve mentioned, I’m planning to rewrite this app anyway, probably using Python. This should make these pre-req issues much easier, as I can compile the whole thing into a single executable containing all the libraries needed. Yes that would be easier. I?ve done this because the clock on my CurrentCost meter keeps losing time………. Here is the reply from Current Cost when I asked about the clock and Temp. “Some early version displays had a clock issue that (curiously) resolves itself -due the mechanical nature of the oscillator. Hm I have a 2400 and a 9600 buad unit and the clock is bad on both. Southern Electric have agreed to send me a new unit as the 2400 one will not display the correct Cost per Day/Month at night. It stays on the Day rate. Here is an update. Southern Electric have sent me a new unit. However, it has the same fault as the first one, it will not display the correct Cost per Day/Month at night. It stays on the Day rate. I have moved the sensors apart and have even moved one to the other leg i.e one on the live and one on the neutral. Thinking they maybe upseting each other, I dissconected the first one but the second sensor still read low. Luckily, I have a set of tails that go to a seperate consumer unit. From this I can plug just one device in, say one 100W bulb and see which sensor is the closest. What a pain !!! Follow up to the above. It would appear that the sensor is most sensitive at the bottom of the clamp i.e the part futhest from the claw opening. So I now have the sensor that reads the highest hanging on the tail by the top of the clamp. The other one is attached so that the tail is up against the bottom of the claw. Now they are within 10% of each other. 604 watts and 579 watts. I still need to do the 100W light bulb test. I’ve just started playing with a Swalec branded CurrentCost from EcoGadgetShop (it’s a 9600 baud unit) and I found this page while searching for information on the data format. I’m a bit confused about the hourly format. If I understand you correctly, I should see the same data in th h4 slot at both 18:59 and 19:00, and that would be the figure for the consumption between 16:00 and 18:00? What I am seeing though, is that the data seems to “roll over” on each odd hour, so the h4 reading at 18:59 in my logged data was 1.1, while at 19:00 it was 0, and H6 becamame 1.1. Similarly, the day data rolls over at 23:00, which seems a bit odd. As far as I can tell there’s no provision for daylight savings time, so I’m not sure if I am doing something wrong. Any ideas? I am using a current-cost meter that sends the current energy every 6 seconds in watts and I am storing these values in the database i.e. currentEnergy = currentEnergy + liveEnergy and counter = counter + 1 so at the end of the day i m having the total sampled value and total no of sample with sampling rate as 1 sample in every 6 seconds and they are 10097246 Watts & 10976 samples. if i divide the total sampled energy with total no of samples i.e. 10097246/10976 = 919.94 Watts per sample. How do i calculate the kW-hr for that day?? @Tim – I rewrote my hour handling code after writing this post (and the comments above) because it looked wrong to me. Update: Actually, this is not true. See below for explanation, but in short – hoursago should be 0 for <h2>, 2 for <h4>, 4 for <h6> etc. I think this is right, but to be honest if you want the definitive answer, it might be worth contacting CurrentCost themselves? @Dewang – have you read http://dalelane.co.uk/blog/?p=273 ? Thanks for the reply, Dale. Looking at your code snippet quickly, I think that you may be 2 hours (one slot) out? @Tim – Thanks very much for the reply – nice to have this confirmed. I’ll adjust the code to make it clearer, but it’s not gonna make any difference to the result so that’s nice to hear. The 11pm rollover thing was a surprise though! Thanks for the app. After using it for about two weeks I am finding it very useful. Are there any plans to pull the temprature values from the meter too in future – may be useful as a reference. For info – the issue with the clock. I have the CC128 and the clock is very unreliable. @Tony – I’m probably not going to do anything with the temperature. The app is focused on using information from the meter history, which doesn’t store temperature data. Techtoniq have a CurrentCost app which is more focused on capturing and displaying live data, including temperature. Perhaps that would be worth a try? Have got xml data coming through using hyperterminal – now trying to graph the hourly/monthly etc history – using your app would seem to be perfect. Any help much appreciated.